Baseball is little more than a curiosity in China but it is developing a following in high schools and universities. There about 60 university teams and a national team with American coaches. The biggest impact that American baseball seems to have had so far is the popularity of New York Yankees baseball caps. Counterfeit Yankees and Dodgers caps are common sights in China. Americans have been trying to develop baseball in China for some time. Former Dodgers owner Peter “O’Malley, oversaw the building of a stadium in the coastal city of Tianjin in 1986.In January 2011, China announced it was going to hire 20 baseball coaches from Taiwan as part of an effort to boost its baseball program. Wang, the trucker, said he couldn't resist buying a baseball when he purchased his bat for about $9 at a sporting goods store. He figured he and his 8-year-old-son could give the exotic American sport a try before he took the bat on his next trip. "Nobody could hit the ball," Wang said. "We kept swinging and missing." The government-backed China Baseball Association was launched in 2002 and has four teams in its league and a 30-game playing schedule. The League has had a tough time. It got off to a bad start when its American promoter pulled out and the league was turned over to a Japanese company. No Chinese has ever played in the Major Leagues. Some Chinese-Americans and Taiwanese have. 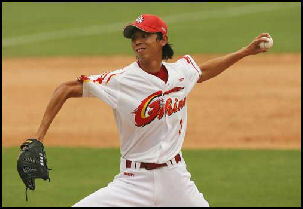 Pitcher Lu Jiangang played for a farm teams for the Japanese team the Chunichi Dragons. Wang Chao, a mainland Chinese, plays for a minor league team affiliated with Seattle Mariners. Sun Lingfeng, a center fielder with the Beijing Tigers, has been called the Chinese Ichiro. He was the Chinese League MVP in 2005 and has helped his team to three straight championships. The Chinese national team has been was coached by former Dodger and Major League manager Jim Lefevre since 2003. The Chinese beat a good South Korea team in a qualifier for the World Baseball Classic in 2005. In the World Baseball Classic in 2008 China got pounded 14-0 in a mercy-rule game against South Korea that lasted only seven innings but stunned favorite Taiwan in game broadcast live in China and held its own in a 4-0 loss to Japan, the eventual champions, in a game in which Chinese team members were smiling and high fiving each other in the locker room after the game. All in all it wasn’t a bad performance for team that hadn’t played since summer and showed up late with 10 pitchers when it was originally planning to bring 16. Chen Junyi in 2008 China made its Olympic debut in baseball in Beijing against Canada. Before the game there were lion dances and other forms in entertainment, China held their own in the first three scoreless inning but began to lose it after Canadian batter Scott Thorman hit a three-run homer and eventually lost 10-0. Later the Chinese team came back and surprised everyone with a 12th inning 8-7 victory over Taiwan in a game in which the Chinese team scored five runs in the 12th innung to come back after the Taiwanese scored four runs in the same inning. In the game against the United States, catcher and top player Wang Wei tore a ligament in his knee and was knocked out of the game in a home plate collision with the U.S.’s Matt LaPorta. Wang plays in the Class A California League in the Seattle Mariner’s farm system. LaPorta later suffered a mild concussion after being hit on the head by a pitch from Chinese reliever Chen Kun, who was ejected. Major League baseball is attempting to introduce baseball to China, eying the huge market potential for the sport with yuan and dollar signs in its eyes. It has teamed up with the China Baseball Association to promote baseball throughout the country. As part of the campaign, professional and university coaches from the United States have visited China to scout for young talent; top Chinese coaches have traveled to the United States for on site training with Major League clubs; and the Major League has set up development programs in China such as Pitch, Hit and Run, which is popular with American kids. The Major League has made some progress. A 2008 survey by market research firm TNS Sport Asia found that 16 percent of Chinese have some interest in base ball and 26 percent are interested in Major League merchandise. There are now little league teams in place like the industrial town of Wuxi that play with uniforms and equipment supplied by the U.S. Major Leagues. A school that has a baseball program encourages kids to watch televised Major League games and has Chinese translations of magazine articles about baseball. According to the Chinese Baseball Association 4 million Chinese play the game. If baseball is ever going to reach a level of popularity approaching that of basketball it needs a star player to capture the imagination of fans and provide a role model children who might take up the game. The sport was dealt a blow by its removal from the Olympics. Major League Baseball opened an office in Beijing on the summer of 2007. It is training coaches who in turn will train 100,000 Chinese youths. Hall of Farmer Cal Ripken Jr has visited Shanghai courtesy of the U.S. State Department to promote baseball there. He found a receptive audience among schoolchildren who had never heard of baseball. The World Series was broadcast on a Chinese sports channel for the first time in 2007. Major League baseball has launched an ambitious plan to introduce baseball to 100,000 elementary school students. It has donated bats and thousands of balls and gloves to participating schools. But there are a lot of obstacles to overcome, namely that there are not enough fields to play baseball. One reason the current campaign is aimed at elementary schools is that young children can play on smaller fields because they don’t hit the ball very far. The Major League strategy is to find an area where it can make progress at the least cost and dig in for the long haul. It set up an office in Beijing in 2007, has sent a traveling baseball amusement park around the country to expose people to the game and established programs at primary schools to teach baseball fundamentals. When parents raised concerns about kids getting hurt squeeze balls and rubber bats were introduced. The New York Yankees have sent coaches, scouts and trainers to China to search for talent and help raise interest in baseball. Under an agreement the Chinese Baseball Association will send players and coaches to Yankee facilities in the United States and Yankee personnel will assist the Chinese national team. The Yankees may be the first to open an academy in China of the sort that have sprung up in the Dominican Republic. The Yankees and the Seattle Mariners have each signed two Chinese players. The Yankees acquired pitcher Kai Liu and catcher Zhenwang Zhang. 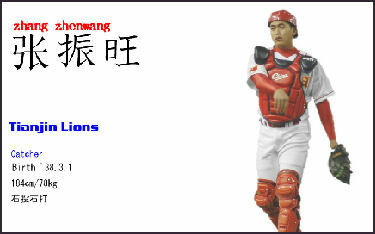 The Mariners got catcher Wei Wang and infielder-outfielder Yu Bong Jia, both players with the Beijing Tigers. The Los Angeles Dodgers and the San Diego Padres played an exhibition game in Beijing in March 2008 at the stadium hosting Olympic baseball games. Dodgers manager Joe Torre and Padres vice president Dave Winfield---both key members of the Yankees in the past---visited China to promote the event. Security concerns prevented a group of Cub Scouts from coming on to the field as planned. About 12,000 people showed up. Concession stands sold hot dogs and peanuts. There were also cheerleaders and women that cleaned up discarded peanut shells. According to the Los Angeles Times, the bid terms proposed by the Burke group call for an all-cash payment to buy the Dodgers, all real estate related to the team and the team’s media rights. Attorneys for McCourt have said he could try to keep Dodger Stadium and the surrounding parking lots. The bid expires in 21 days, with the goal of closing a deal within 90 days, subject to the approvals of the bankruptcy court and Major League Baseball. The Times story says that the previous record sale price for a major league franchise is $845 million, set two years ago when the Ricketts family bought the Chicago Cubs from Tribune Co.